Is there a better way to deal with your debt than bankruptcy? It depends mostly on your circumstances and how far in the hole your financial situation has taken you. What I mean is that if you’re already behind on your debt and the debt is so large you are unable to pay it off in a reasonable amount of time then you are in a deep “hole”. The first step to determine whether there is a better way than bankruptcy and to know what other options might be out there. In general, there are only three options that will help someone avoid bankruptcy when they are faced with a large amount of debt. The pros and cons of debt settlement are very simple. Generally to get the best settlement you have to pay the lump sum settlement amount immediately. So you have to first assess whether you have the ability to settle your debt by having access to a large amount of cash. How much money you ask? The rule of thumb is that you can generally settle between 30 and 50 percent of the balance due. This depends on how delinquent the debt is. The more delinquent the debt, the greater the chance the creditor will take less to settle it. Beware. There are many debt settlement scams out there which will put you on a payment plan. However, these are not actually settlement companies. They may be adjusting the debt, but this is not the same as settling the debt in full for only part of the total amount owed. The problem is that as they attempt to settle the first debt the remaining debts are not getting paid. At some point, the lawsuits from the creditors who have been waiting in linestart coming and a garnishment defeats your ability to continue. Harsh but true. There are two types of consolidation. The first is where a bank or finance company will consolidate your debt into one large loan and you pay a single payment to pay off the debt. This gemerally requires good credit to qualify for the loan. If your credit rating has already dropped then this option may not be available to you. The second type of consolidation is through a credit counseling agency. They negotiate with your creditors to possibly reduce the principal and interest and pay the balances through a single payment distributed by the agency. In general the repayment period is around 48 months. The problem with this option is that many of these for-profit companies take their fees in advance. Because the agency is being paid first and as you start your payment plan the creditors are not receiving their payments quickly enough and may decide to sue you or not participate in the program. Option 3. Pay something, even if it is not the full monthly payment. Doesn’t work. Urban legend. Paying less than the minimum monthly payment is called …. breach of contract. Good intentions do not trump a garnishment. Moving on. Many people believe they can run from the debt because they work under the table or they think they are not vulnerable because they don’t keep money in their bank account which can be garnished. The problem with this approach is that while you may be less vulnerable to wage garnishments your credit life is basically at a standstill. You will not be able to purchase a house, get a vehicle loan at a decent interest rate, or be excluded from access to credit in general. When comparing these options to bankruptcy, bankruptcy has three things over these three options. The first is that bankruptcy immediately stops the harassment and protects you from legal action and garnishments. Creditors will have to stop calling you and will not be able to garnish you. The second advantage bankruptcy has over these non-bankruptcy options is that you do not have to repay the debt. If your cash-flow has been reduced enough to eliminate any disposable income, do not pass go, but go directly to the bankruptcy line. With bankruptcy, Chapter 7, you will not be in the long-term repayment plan. Additionally, instead of struggling with poor credit and no disposable income to make payments you can eliminate the debt immediately and begin rebuilding your credit score. The third advantage bankruptcy has over these options is that your credit begins rebuilding immediately. The greatest myth that people have about bankruptcy is that your credit score drops to zero and you are unable to rebuild for a long time. The reality of bankruptcy and how it affects your credit score is that the bankruptcy has between 50 and 100 point effect on your score. How much it drops depends primarily on how high your score is to begin with. The higher your score the larger point hit it will take when you file bankruptcy. However, your score will immediately rebound as your FICO score is recalculated 30 days after filing bankruptcy. Your score will actually go up because your creditors are no longer reporting you as delinquent. To summarize, bankruptcy generally trumps over these other options when the debt is seriously delinquent, you have lost income, or you the debt is too large to be paid off in a reasonable time. In general, bankruptcy can be the cheapest, fastest, and easiest way to eliminate your debt and quickly recover your credit score. 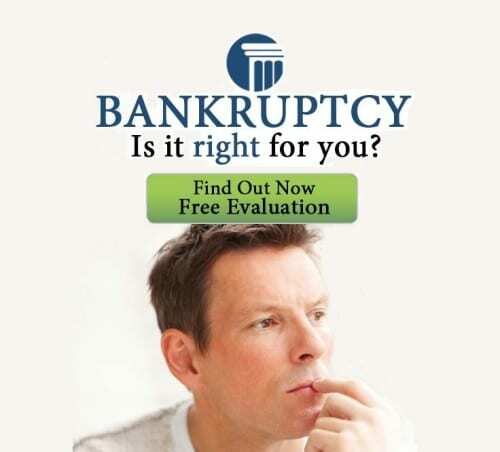 If you have a question about whether bankruptcy is a good option for you call to schedule a free evaluation. 800-662-8813.